Dr. Saba’s clinical interest and expertise have focused on the management of arrhythmias and conduction abnormalities of the heart. He has wide experience in implanting and managing all cardiac implantable electronic devices (CIED), including pacemakers, defibrillators, and cardiac resynchronization therapy devices. He also has expertise in ablation procedures of ventricular and supraventricular arrhythmias including atrial fibrillation and ischemic ventricular tachycardia. 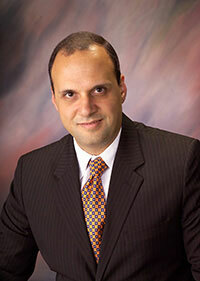 In addition, Dr. Saba is nationally recognized for his expertise in CIED lead management, including lead extractions. Dr. Saba's educational interests are in mentoring medical students, residents, and fellows in the design, planning, execution, analysis, interpretation, and publications of clinical research clinical research. Voigt, A., Ezzeddine, R., Barrington, W., Obiaha-Ngwu, O., Ganz, L.I., London, B., Saba, S. Utilization of Implantable Cardioverter-Defibrillators in Survivors of Cardiac Arrest in the United States from 1996 to 2001. J Am Coll Cardiol. 2004; 44: 855-858. Triola, B., Olson, M.B., Reis, S.E., Rautaharju, P., Bairey Merz, C.N., Kelsey, S.F., Shaw, L.J., Sharaf, B.L., Sopko, G., Saba, S. Electrocardiographic Predictors of Cardiovascular Outcome in Women: The NHLBI-Sponsored WISE Study. JACC. 2005; 46: 51-56. Saba, S., Volosin, K., Yee, R., Swerdlow, C., Brown, M. Combined Atrial and Ventricular Anti-Tachycardia Pacing As a Novel Method of Rhythm Discrimination: The Dynamic Discrimination Download Study. Circulation. 2010; 121: 487-497. Saba, S., Mehdi, H., Mathier, M., Islam, Z., Salama, G., London, B. Effect of right ventricular versus biventricular pacing on electrical remodeling in the normal heart. Circulation Arrhythmia and Electrophysiol. 2010; 3: 79-87. Liu, J., Rattan, R., Adelstein, E., Barrington, W., Bazaz, R., Brode, S., Jain, S., Mendenhall, G.S., Nemec, J., Razak, E., Shalaby, A., Schwartzman, D., Voigt, A., Wang, N.C., Saba, S. Fluoroscopic Screening of Asymptomatic Patients with the Recalled Riata Lead Family. Circulation Arrhythmia and Electrophysiology. 2012; 5: 809-814. Saba, S., Marek, J., Schwartzman, D., Jain, S., Adelstein, E., White, P., Oyenuga, O.A., Onishi, T., Soman, P., Gorcsan III, J. Echocardiography-Guided Left Ventricular Lead Placement for Cardiac Resynchronization Therapy: Results of the Speckle Tracking Assisted Resynchronization Therapy for Electrode Region (STARTER) Trial. Circulation Heart Failure. 2013; 6: 427-434. Voigt, A., Shalaby, A., Saba, S. Rising Rates of Cardiac Rhythm Management Device Infections in the United States: 1996 through 2003. JACC. 2006; 48: 590-591. Saba, S., Janczewski, A.M., Baker, L.C., Shusterman, V., Gursoy, E.C., Salama, G., McTiernan, C., London, B. Atrial contractile dysfunction, fibrosis, and arrhythmias in a mouse model of cardiomyopathy secondary to cardiac-specific overexpression of Tumor Necrosis Factor-alpha. Am J Physiol. 2005; 289: H1456-1467. Saba, S., Mathier, M., Mehdi, H., Gursoy, E., Liu, T., Choi, B.R., Salama, G., London, B. Prevention of Adverse Electrical and Mechanical Remodeling with Bi-Ventricular Pacing in a Rabbit Model of Myocardial Infarction. Heart Rhythm J. 2008; 5: 124-130. Khodanji, A., Maillart, L., Prokopyev, O.A., Roberts, M.S., Saba, S. Dynamic Abandon/Extract Decisions for Failed Cardiac Leads. Management Science. 2016; in press. Funding Agency: Boston Scientific Corp.